Guidelines on how and when you'll earn ClassTag Rewards. The ClassTag Rewards program went live on August 3, 2018. The new program is designed to help support the students’ educational needs while reducing teachers’ out-of-pocket expenses. Let's talk about how it works.. 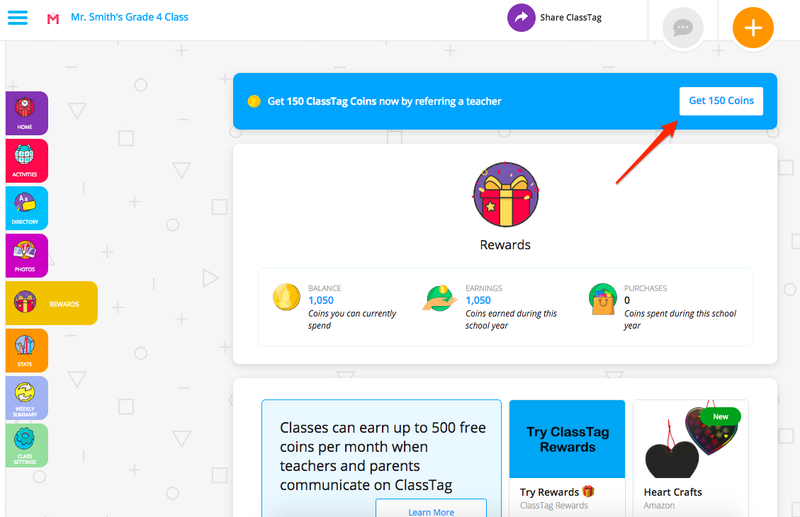 Through parent engagement, classrooms/teachers can earn ClassTag Coins which will be distributed after the end of the month. 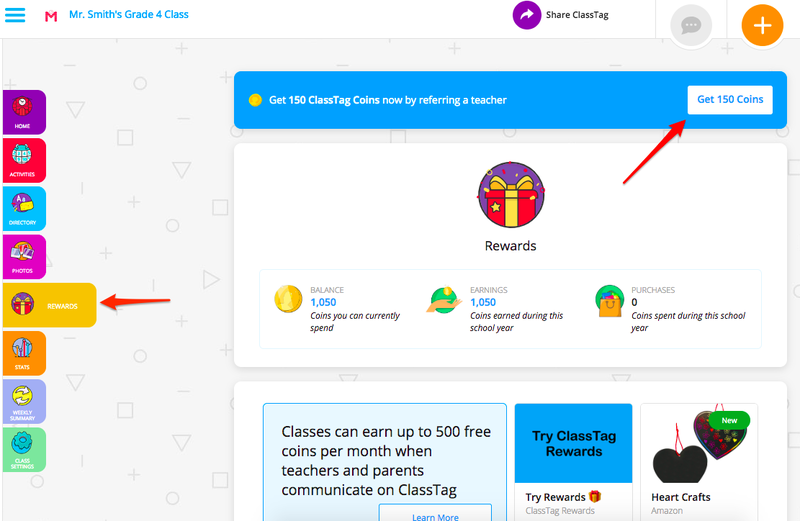 You invite parents to join your class and start using all the great features ClassTag has to offer -- posting announcements, sending private or group messages, scheduling parent-teacher conferences, asking parents to complete a to-do item, and setting up events and volunteer sign-ups. As parents become engaged through reading announcements and signing up for activities (e.g., events, volunteer requests, to-do item, parent-teacher conferences), your classroom will earn ClassTag Coins. On the first week of each month, ClassTag Coins will be deposited in your classroom account. Our Rewards are specially curated to offer a range of products from popular education companies! You can learn more about the Reward offers HERE. 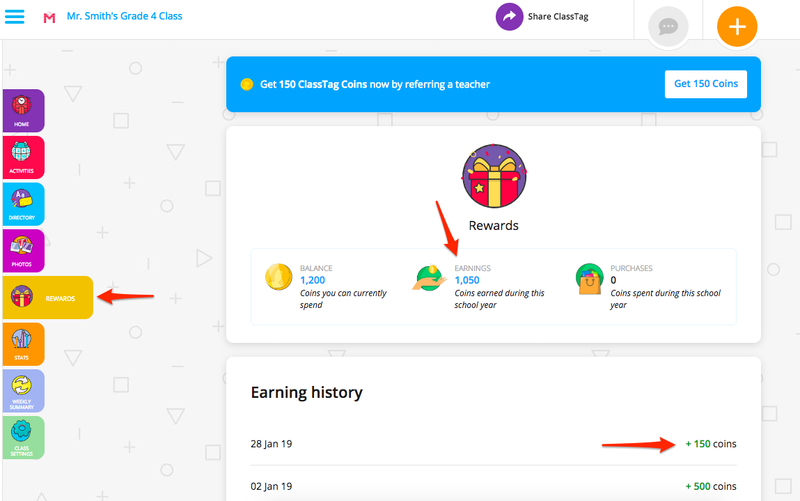 Teachers click the “Get 150 Coins” icon on the Rewards page. From the referral page, all you need to do is enter another teacher's email address or even share it via social media. Make sure they use your UNIQUE referral code. This ensures you get credit for their referral! Check back your “Earnings” to see if the 150 points are already deposited. As soon as your referred teacher gets signed up, starts a classroom, and verifies his/her email address, you'll both get 150 coins! We appreciate your help on sharing your love of ClassTag with other teachers! More questions? Please feel free to send us email at rewards@classtag.com if you have any question or feedback.